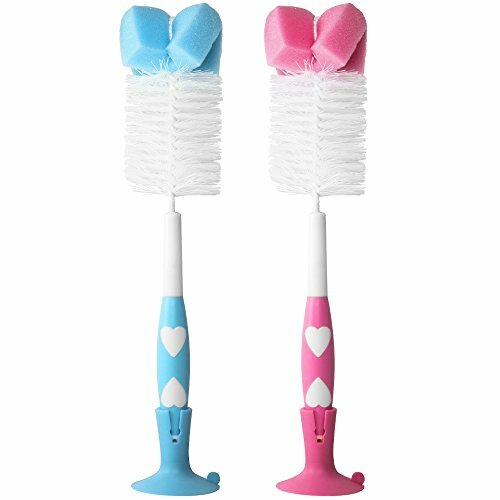 Baby Bottle Brush Premium 2pc Set by Max Strength Best Brushes for Cleaning Milk, Water & Sports Bottles, Includes Detachable Stand, Easy Grip Handle, Strong Bristles, Easy for Travel! Your search for Premium Bottle Cleaning Brushes are over! For a Complete Peace of Mind! Introducing the Max Strength Baby Bottle Cleaning Brushes to Put Your Life at Ease! - Premium build quality ensures you get the best bang for your buck! - 2 brushes per set giving your months of cleaning! - Genius design - soft sponge on top backed by strong bristles and easy grip handle. - Tackles even the hardest to reach spots, no stains left behind. - Portable making it easy to take on your travel! - Complete money back guarantee if you are not FULLY satisfied.